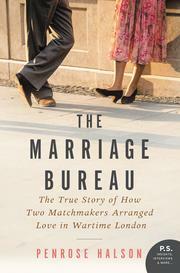 The Marriage Bureau: The True Story of How Two Matchmakers Arranged Love in Wartime London. Before there was Match.com, E-harmony or Tinder, there was The Marriage Bureau, in 1938 London, which is recounted in Penelope Halson’s book of the same name. In 1992, Penelope and her husband were asked to take over the Bureau. They ran it till 2000. Penelope is still in touch with many of the clients. To write this book she drew from her own experiences running the Bureau, along with the Bureau’s extensive archives, newspaper, magazine articles, advertisements, registration forms, letters, photographs, and books by both Mary and Heather, the founders of the Bureau. I wasn’t going to read this book, but I’m really glad I did. This is a true account of a couple of friends, both 24 yr. old, Mary Oliver and Heather Jenner, who decide to start a matchmaking service during 1938 right before the start of World War II. The Marriage Bureau was one of the few businesses that made money during World War II. Mary went to visit her Uncle George in Assam, India and he gave her the idea of starting a marriage bureau in London. There were so many young men working overseas and the availability of suitable wives was non-existent. He suggested Mary do something about that. Mary found a partner in Heather, who was practical and logical. Mary was more romantic and imaginative. They complimented each other and were perfect partners. The Marriage Bureau was formed and thanks to publicity in local newspapers, it was successful right from day one. Clients would come in and be interviewed, and would tell the interviewer what they wanted in a potential spouse. They paid a small fee. After dating if a match led to marriage, they paid an After Marriage Fee. Most couples married between two weeks and 6 months. The stories of the clients are happy, and sad. Heather and Mary even found a match for a client they both felt was unappealing and disagreeable. There are two lists included at the end of the book that are worth reading. Able to play a portable instrument (string or woodwind) well. Mary and Heather were women ahead of their time. I found the book both interesting and entertaining. This is definitely worth a read especially if you love mail-order-bride stories, arranged marriages, WW2 history, and happily ever afters. I received a copy of The Marriage Bureau from Romance Junkies Reviews for an honest review.